I’m too lazy to write a blog tonight. In fact, I’ve been too lazy to do much of anything so far this week. My laptop power cord just fell on the floor but I’m too lazy to reach down from the bed and pick it up. I was supposed to go to yoga, but woke up from my three-hour nap five minutes after the class had already begun. I think I might blame my laziness on the heat. 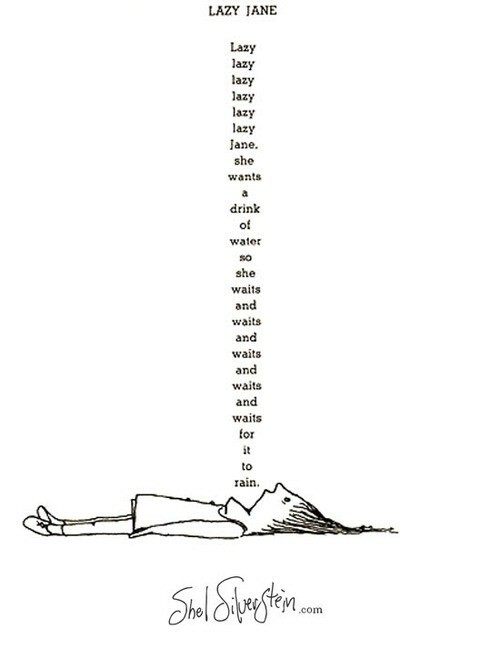 Anyway, I did find this poem by Shel Silverstein which pretty much exactly captures how I have been feeling and behaving this week. I hope it passes soon, because being lazy is kind of boring.